We can provide reclamation units that comply with the EPA regulations. They are avalible with either a cartridge in-line gravity filter or an electrolytic terminal unit. The Silver Trap Window is an industry leader in metallic exchange silver recovery technology. Silver Trap Windows feature clear housings, allowing you to watch your silver accumulate. Historically, they last longer and collect more silver than traditional recovery buckets. Dimensions are 7.6"H x 5.0"D x 5.0"W. Ideal for all fixers. The 643 consists of a silver recovery head and one tank. 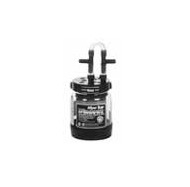 The tank is a four gallon tank which holds approximately three gallons of fix. The 643 was designed to meet the silver recovery needs of the graphic, medical, and nondestructive testing markets. The 643 can be used for batching or as a tailing unit behind the X-Rite 646 or 650 to meet higher volume requirements. There is no hookup required between the processor and the 643 when a batching process is used. The waste solution must be manually taken out of the processor and poured into the 643 tank. When the tank gets filled up to the "level Line" (+/-1/2"), desilver the solution per instructions.